During a debate with his rival, Sen. Ted Cruz (R-Texas), Rep. Beto O’Rourke (D-Tex.) was asked point-blank about a drunken-driving incident when he was 26: Did he try to leave the scene of the crash? The Houston Chronicle and San Antonio Express-News had recently obtained police reports of the collision and reported that O’Rourke had done so. O’Rourke responded with what appeared to be a well-practiced answer. He flatly denied trying to leave the scene of the crash but added that driving drunk was a “terrible mistake” and that he would not provide an excuse. He then segued into a riff about the importance of second chances. Cruz, for his part, said he would not discuss the issue but diverted to a discussion of O’Rourke’s sponsorship of a resolution in 2009 to debate legalizing narcotics when he was on the El Paso City Council. Interestingly, Cruz appeared to try to make his point fact-check proof; he had earlier earned a “false” from PolitiFact Texas for saying that the resolution was to legalize all narcotics, rather than just to debate the issue. O’Rourke’s assertion that he did not try to leave the scene of the crash, however, is disputed by police records. So, that’s worthy of a fact check. About 3 a.m. Sept. 27, 1998, in Anthony, Tex., a suburb 20 miles north of El Paso, police officer Richard Carrera was dispatched to the scene of a motor vehicle collision on Interstate 10 about a mile from the border with New Mexico. He met with the driver, identified as Robert Francis O’Rourke, and asked him what happened: “The defendant advised in a slurred speech that he had caused an accident,” Carrera wrote in his complaint charging O’Rourke with driving while intoxicated. When O’Rourke blew into a breathalyzer, the results were a blood alcohol content of 0.136 and 0.134. The legal state limit in Texas at the time was 0.10; a year later, it was lowered to 0.08. With a blood alcohol level of between 0.130 and 0.159, a person experiences “gross motor impairment and lack of physical control. Blurred vision and major loss of balance. Euphoria is reducing and beginning dysphoria (a state of feeling unwell).” For a male of 190 pounds, O’Rourke’s weight as listed in the police report, that blood alcohol concentration is reached after six drinks. In his DWI interview, O’Rourke said he last ate at 7 p.m. — pasta — and consumed two beers. He also mentioned that he had a cold. There are some inconsistencies in the police records — O’Rourke’s Volvo is described as both black and green, and he’s traveling either west or east — but the witness to the crash is twice described as saying O’Rourke tried to leave the scene of the crash. The witness is not identified. We could not locate Carrera, who no longer works for the Anthony Police Department, for further comment. The charges were dismissed after O’Rourke completed a court-approved diversion program, the Chronicle said. His father had been El Paso County judge, an elective position, from 1982 to 1986 and was running for the position again in 1998 after switching parties from Democrat to Republican. (He lost.) There is no indication his father’s political prominence played a role in the outcome of the case. Update: Several readers objected to this fact check, saying we could not rely on police reports because they often have incomplete and contradictory information. Readers noted that O’Rourke was not charged with leaving the scene, other possible witnesses were not interviewed and the police officer did not personally observe O’Rourke trying to flee. Some readers suggested that O’Rourke was simply trying to move his car. Stephen G. Peters, an El Paso defense lawyer who has handled DWI cases since the 1990s, said pretrial diversion is at the discretion of the district attorney. “If the D.A. had really believed Beto had tried to flee, it is my opinion they would not have given him pretrial diversion,” he said. It is worth noting, however, that O’Rourke did not directly answer a question about the information contained in the police reports. Update, Oct. 1: In an interview with Texas Tribune chief executive Evan Smith on Sept. 29, O’Rourke said “the police report on this count is wrong." O’Rourke added: “I reached out to the passenger who was in the car that I was driving — who also does not appear in the police report, among other factual errors — somebody that I’ve not spoken to in more than 15 years, and asked her recollection of that evening. She said, ‘No, we were in the median of the road. We did not try to flee. I don’t know that there was anywhere we could have gone.’” O’Rourke has not identified the passenger. At The Fact Checker, we place a high value on contemporaneous records. The police reports show not only that O’Rourke was highly intoxicated but that a witness to the crash said he tried to leave the scene. O’Rourke was so drunk that he could barely get out of the car without falling, so perhaps he would not have gotten far — or he was simply confused. Perhaps in his memory, O’Rourke believes he did not try to leave. But, given his blood alcohol content at the time of the crash, O’Rourke’s memory 20 years after the fact is not nearly as credible as the police reports written just hours after the crash. Even if one is inclined to dismiss police reports as riddled with errors, it is the one contemporary record we have. O’Rourke could have dodged the question during the debate or he could have said his memory of the night is not clear. Instead, he chose to dispute the factual record. We also believe in second chances, and O’Rourke should revise his answer if given another opportunity. 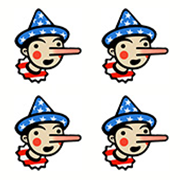 In the meantime, he earns Four Pinocchios.